Located within walking distance to Morey’s Piers and Waterparks. A “Doo Wop” Wildwood Motel! Swim, Sunbathe and Relax at the Caprice Wildwood Motel or spend your day at the beach. Take a stroll along the sand, parasail, jet ski or scuba dive. Do it all or nothing at all at the Caprice Wildwood Motel! Conveniently located across the street from the Beach and Boardwalk, 1 block north of the busy Wildwood Convention Center. Step across the street to 4 Miles of golden sun-drenched beach is perfect for family fun. While the kids make sandcastles, enjoy the sand between your toes and the sheer bliss of the warm sun caressing your skin. Take a tram ride along the boardwalk and stop for breathtaking rides and water-parks. After the beach and boardwalk you can enjoy helicopter rides, fishing trips, sightseeing tours, dolphin watches, playing tennis, bowling, golfing, and the nearby excitement and nightlife of Atlantic City. 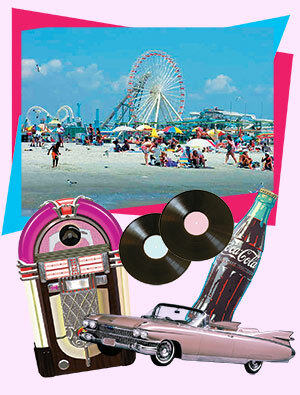 It all starts at the caprice Motel in Wildwood, NJ! The Caprice Wildwood hotel is located a half block away from our world famous boardwalk and directly next to Mack’s pizzeria. The Caprice Hotel is within walking distance of Wildwood’s several amusement piers and water parks, while also being only one block away from the Wildwood Convention Center and a few blocks from Morey’s Wild Wheels amusement pier. The Wildwood Convention Center is located one block away from the Caprice Widlwood hotel and we are also right next to Fox Park, where the public can play on tennis courts, basketball courts and also a baseball field. The 2.5 mile Wildwood boardwalk next to the Caprice Wildwood hotel is home to an abundance of arcades, fun t-shirt shops, gift stores, Italian and Greek cuisine, and ice cream and family food. Take a ride on Wildwood’s memorable tram car or indulge yourself by eating some of Wildwood’s famous salt water taffy and fudge from many its historic stores. As mentioned before, the famous Mack’s pizzeria is right next door to our hotel, along with the Fudge Kitchen. Our wildwood hotel has free Wi-Fi, an outdoor pool area and BBQ’s for your family to enjoy. Our customers can make use of our laundry room as well. Every room at the Caprice hotel comes equipped with a TV, refrigerator, microwave and tiled floors. We will soon have a Jacuzzi for our customers to use as well in the near future. Several restaurants are located near the Caprice, along with many pizzerias ready to serve take-out food or to deliver at a moment’s notice.